World Tai Chi and Qi-Gong Day - "One World … One Breath"
What is World Tai Chi and Qigong Day? World Tai Chi and Qigong Day (WTCQD) was founded by Bill Douglas. It is an annual event held the last Saturday of April each year to promote the related disciplines of Tai Chi Chuan and Qigong in sixty countries since 1999. The mission of this multinational effort is ongoing, to expose people to the growing body of medical research related to traditional Chinese medicine and direct them to teachers in their home towns. Anyone can join in, whether you are a spectator or belong to a martial arts or tai chi club. The New Zealand Kung-Fu Wushu Federation and the New Zealand National Tai Chi Chuan Association jointly hosted the World Tai Chi and Qi-Gong Day celebration held on Sat 30 April 2011 at 10.00am - Onslow College, Burma Road, Johnsonville. The day was a great success with a wide variety of Tai Chi demonstrated by local Instructors and Clubs including: Wellington Yang Style Tai Chi; Southern Tai Chi AssociationClub; Plimmerton Kung Fu Tai Chi Club; Fierce Tiger Tai Ji Quan; Qi Gong Tai Chi Chuan Wellington; Tai Chi Chuan Poneke; and Enliven. Special thanks to Ferne McKenzie and Leslie Kentfield for organising the event; to Andy Hardwick for being Master of Ceremonies, and to everyone else who helped and participated. See below for a list of Instructors and Clubs on the programme. Victoria University of Wellington (VUW), was invited as a special guest to the event. Dr Chen was very impressed to see how New Zealanders have embraced Chinese culture through the practice of Tai Chi and Qi-Gong. The Confucius Institute at VUW will operate as a project-based organisation, promoting Chinese language and culture study in New Zealand through educational programs, cultural activities, exams, conferences, events and scholarships. Dr Chen presented Glen Keith, President of the New Zealand Kung-Fu Wushu Federation, with a traditional Chinese fan to mark the occassion. Dr Chen and Mr Keith agreed to work together to promote Chinese culture through Chinese wushu. Read more. 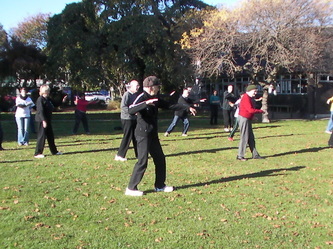 A big turnout of Tai Chi enthusiasts at the Tamaki College Community Recreation Centre, Glen Innes, Auckland. The annual celebration of World Tai Chi & Qigong Day in Auckland has again proved to be a popular event and was attended by over 400 participants and spectators. WTCQD in Auckland has grown to become more than just a local event, with groups from Wellsford, Waiuku, Paeroa, and Hamilton now participating regularly. This year also saw participants coming from far afield as Wellington, Christchurch and Ashburton. A special guest was Mdm. Long Yan Ping, Consul for Culture, who represented the Chinese Consulate General in Auckland. The opening of WTCQD in Auckland began with a count down to the official start time (10:00am local time world-wide) for a mass performance of the 10 Forms Tai Chi Chuan by combined groups*. This opening performance, together with similar performances by other groups throughout New Zealand, kick-started WTCQD for the rest of the world. 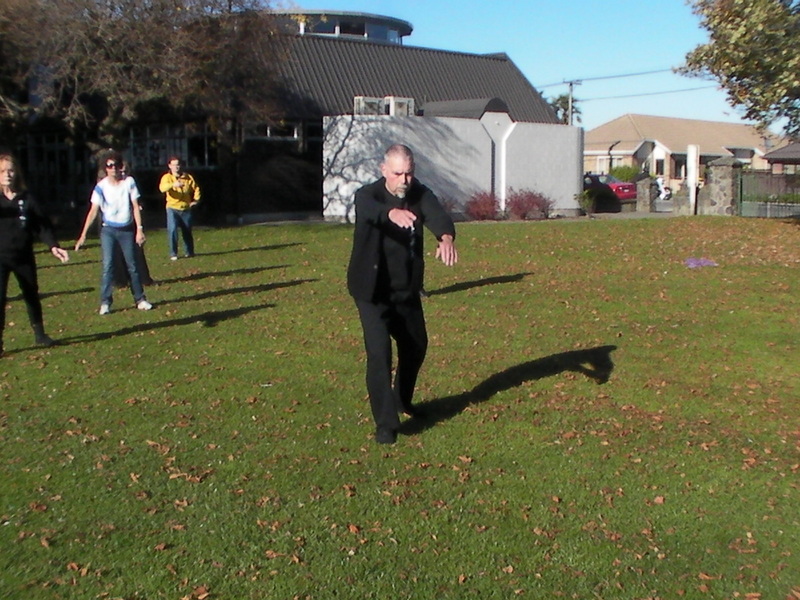 Combined group demonstrations of the other popular Tai Chi Chuan and weapon routines and Health Qigong forms followed. A new item in this year’s programme was a demonstration of the various Dr Paul Lam’s Tai Chi for Health forms. 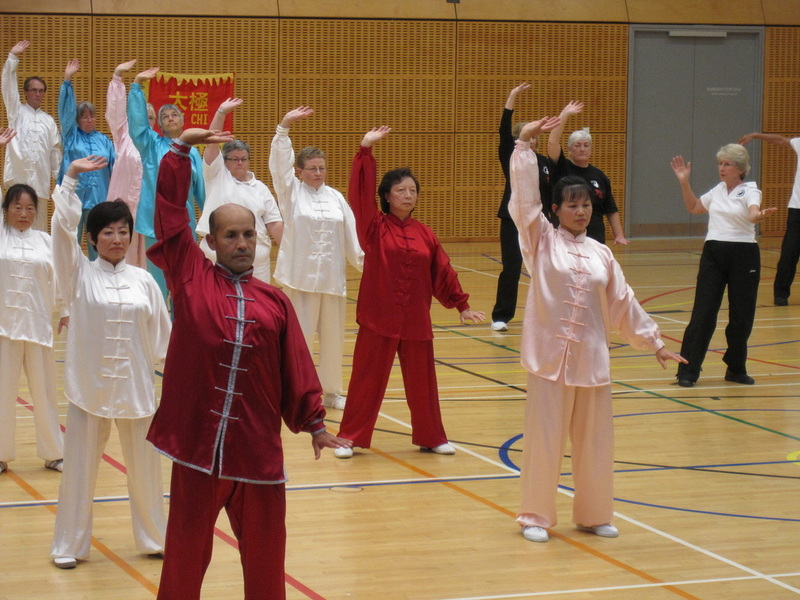 In conjunction with WTCQD in Auckland, the NZ National Tai Chi Chuan Competition was held in the afternoon. For the first time competition categories based on experience levels rather than on age groups, and this had the desired effect of encouraging new and first-time competitors to participate. There were 21 competitors entered in 33 individual events. Auckland report by David Wong. A successful celebration of World Tai Chi and Qi-Gong day was held at Barrington Park, Barrington Street, South Christchurch. 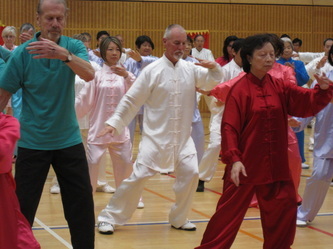 Pictured below leading the groups: (left) Mike Penter - Chairman-Treasurer of the New Zealand National T'ai Chi Ch'uan Association Incorporated, and (right) Jean Whalley.